There are 5 posts in this thread, and it has been viewed 5954 times. So, how better is SS3? Welcome to another (but better) Game of the Week! Still lazy to put up anything again, here's yet another Wiki quote. 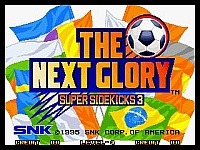 The World Tournament mode is the same as Super Sidekicks 2, above. The new features in this game include naming the player scoring goals for his team and keeping score of how many goals he scores during his team's use by the player. Alongside the "Top Teams" ranking which serves as a high score table for teams, there is a "Top Scorer" table for individual players. The name and use of scoring players is random. The second new feature include regional tournaments, in which a team (from any region) can enter a tournament within its own region or other regions. This is good for those players who like a particular team but don't want to be facing the same opponents every time, as they would if they played the World tournament. Championships include World Tournament (FIFA World Cup), Europe Tournament (UEFA European Football Championship), South America Tournament (Copa Am�rica), Americas Tournament (CONCACAF Gold Cup), Africa Tournament (African Cup of Nations), and Asia Tournament (AFC Asian Cup). 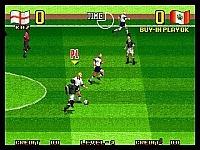 However, the game played and looked exactly like the original Super Sidekicks 3. Even the goal animations remained unchanged. 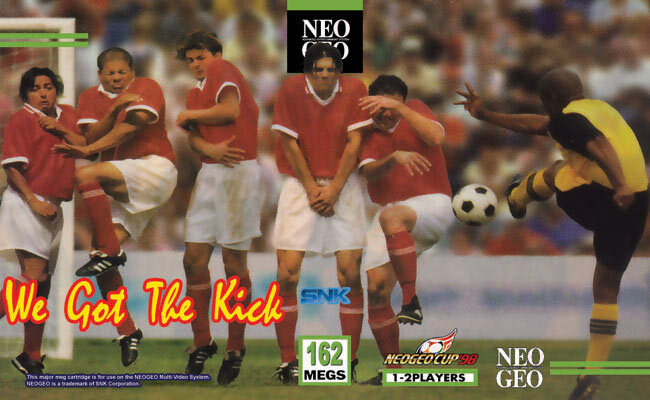 Once again, SNK failed to get official FIFA license and featured fake names. However, some reflect actual players. Roul represents Ra�l of Spain, Dahlgren represents Martin Dahlin of Sweden, and Klinger represents Jurgen Klinsmann of Germany. 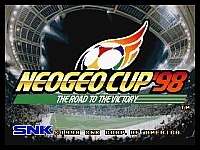 One note is that in Neo Geo Cup 98, teams instead face teams in their group in the 1998 qualification instead of regions in the game. For example, if you choose Spain, you will face Yugoslavia. However, some are inaccurate. Like if you play England, you face Scotland. And if you play as Brazil, you have to face Uruguay before the World Tournament. But Brazil qualified automatically. Too lazy to link them again, lol. Yet another game that I've never played on the Neo. 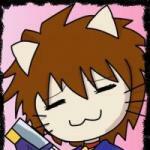 Eventually I will end up playing this game some day. Im going to buy it. I have SSK 2 and dont mind it, but soccer brawl is much more fun!! Never played this one. 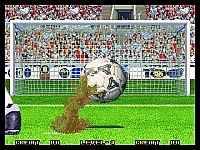 When it comes to soccer titles, I generally stick with Worldwide Soccer 1 & 2 on the Saturn. 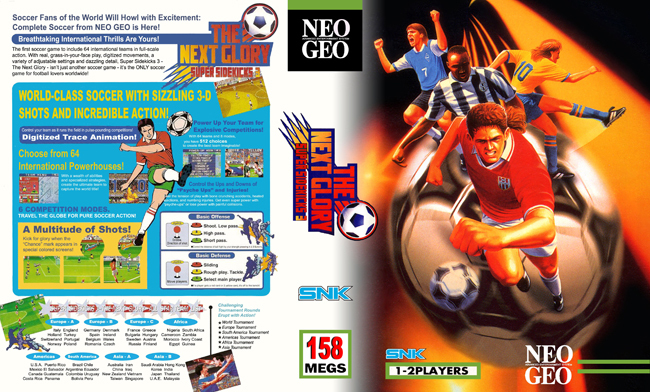 If enough members here recommend the Super Sidekicks series, perhaps I'll check it out.